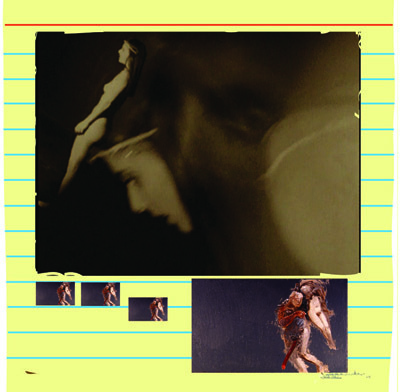 Notes: This image is a detail of a 12"x18" page from one of a number of wordless books by Cliff Eyland and Guy Maddin. Images and a 2003 essay by Eyland about physics and art called Painting the Multiverse. One of thousands of drawings (some are mixed media and coloured, some not) that the artist placed in books during yearly visits (except for 2004) to the New School University's Raymond Fogelman Library (65 Fifth Avenue in New York city) between 1997 and 2005. File Card Works Hidden in Books was organized by New School curator Kathleen Goncharov and Librarian Gail Persky.